The beautiful Bend area is full of life and activities to keep you busy year round. As Dr. Ward has been golfing for years, he understands that wears and tears can limit you if you don’t take care of yourself along the way. 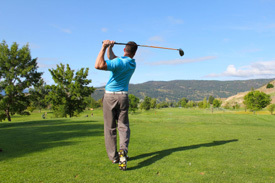 Let Dr. Ward help with your golf swing! Dr. Ward will work with you to come up with a home care plan of exercises and stretches to help you heal and stay well longer. If you follow his recommendations you, can enjoy many more bright days on the green! Dr. Ward wants to help you get and stay well longer. Stay in the game. Call (541) 610-9662 today!